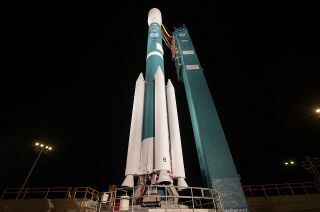 The final Delta II rocket to fly is seen prior to its launch on Sept. 15, 2018 at Space Launch Complex-2 at Vandenberg Air Force Base in California. The rocket garden at NASA's Florida spaceport will soon sprout a new launch vehicle — the newly-retired Delta II. "We are honored to have the Delta II join our historic lineup of rockets in our Rocket Garden," said Therrin Protze, chief operating officer of the Kennedy Space Center Visitor Complex, in a pre-recorded video responding to the news. United Launch Alliance's last remaining Delta II with go on display at the Rocket Garden at NASA's Kennedy Space Center Visitor Complex in Florida, seen here at sunset. Watch United Launch Alliance's announcement of the Delta II display at collectSPACE.